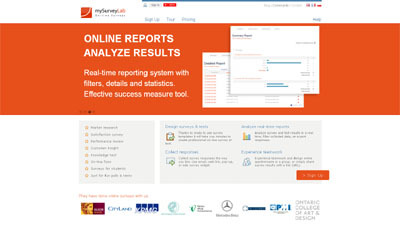 mysurveylab.com is professional online survey software that supports survey creation process, automates response collection and real-time report generation. We provide best survey software for the lowest price. mysurveylab.com provides any language support (including right-to-left languages like Hebrew or Arabic) and multi-language surveys. Advanced survey logic and answers choices randomization. Multi-format export features – csv, xls, xlsx, survey branding and many more.